I went for it today. I had to go bold for Boden. You see, I don't typically wear hats except for the baseball or floppy kind. I have done very few style posts with me in a hat over the last two years. I am not sure why because I own several, they just never seem to make their way into blog land, until today. I knew I had to add this one as the finishing touch to this look. It just seemed like the Boden way since they have the most adorable catalog shots of free spirited models in hats. I know that I am light years away from being a Boden model, but for about 15 minutes, I pretended and used my wild imagination. Boden is known for their heritage inspired style with a casual modern day twist. Their women's line is a mix of crisp and playful pieces with somewhat of an artisan eclectic feel. When I began styling this embroidered skirt, I knew I wanted to keep it clean and classic, but at the same time come across as effortless and carefree. To me, that's the epitome of Boden's style for women; functional, feminine and most importantly fun. They also offer styles for the entire family. If you have little ones and haven't seen the Mini Boden collection, get your wallet ready. They have the cutest graphic tops on the face of the planet and I am NOT getting paid to say that. My girls are proud owners of several. Boden is having a major mid season sale with select styles up to 50% off, but you better hurry because Sunday, October 27th is the last day to snag the deals. You can take 15% off using the code K155 for all non-sale items. Also, you have the chance to win a $25 gift card to use toward your next Boden purchase, plus a few extra surprise goodies to go along with it. Just enter with the Rafflecopter below. I have only 1 skirt from Boden and I love it. Each month when I receive their catalogue I am so tempted! I really like the boho vibe this hat gives. I don't wear a lot of hats only typically big floppy hats in the summer. This is such a great hat on you. I think I need to run to Target. You look great in the hat! Not sure if I could pull it off, but it suits you perfect! You look ADORBS in that hat! 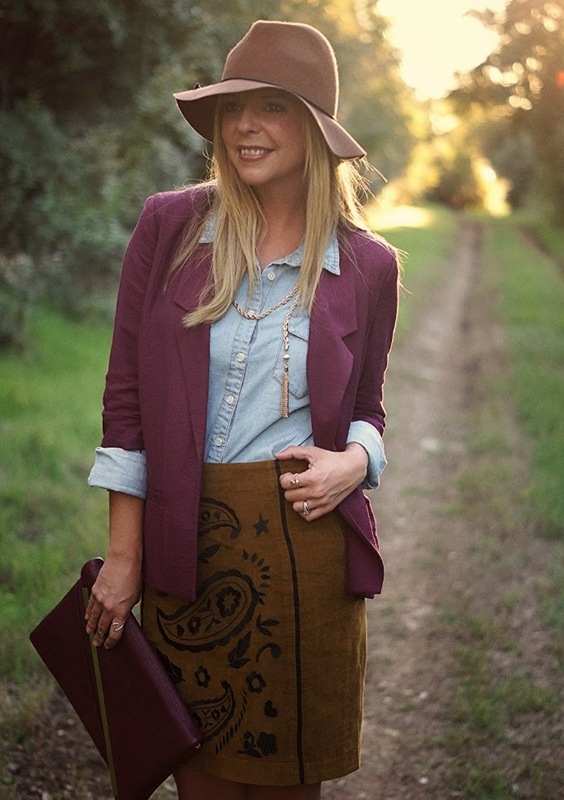 LOVE this boho look on you girl! Love the Bordeaux blazer on top of that denim shirt! Beautiful!! Shanna, this outfit is perfection! Love every piece and how you've styled it and these photos could not be any more gorgeous. Happy weekend! You should wear hats more often...that one is too cute on you! Have a great weekend, Shanna! Love this look! 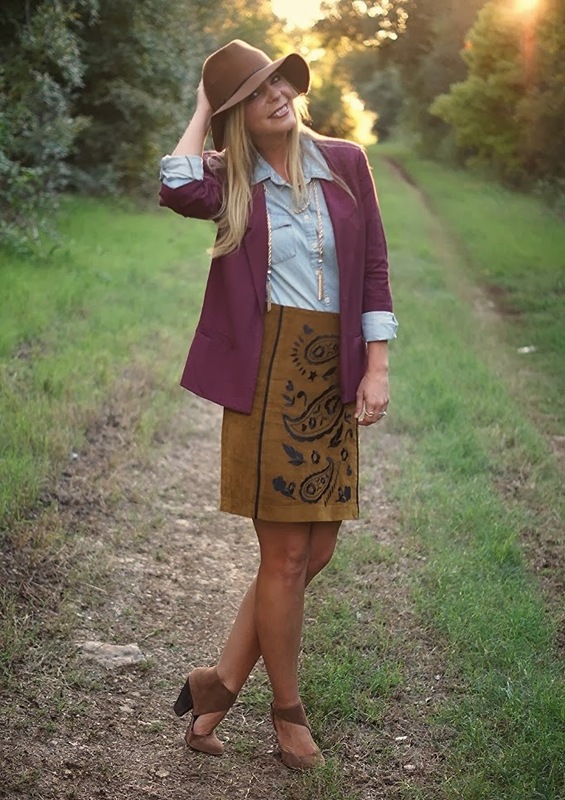 Great fall colors and that skirt is amazing! 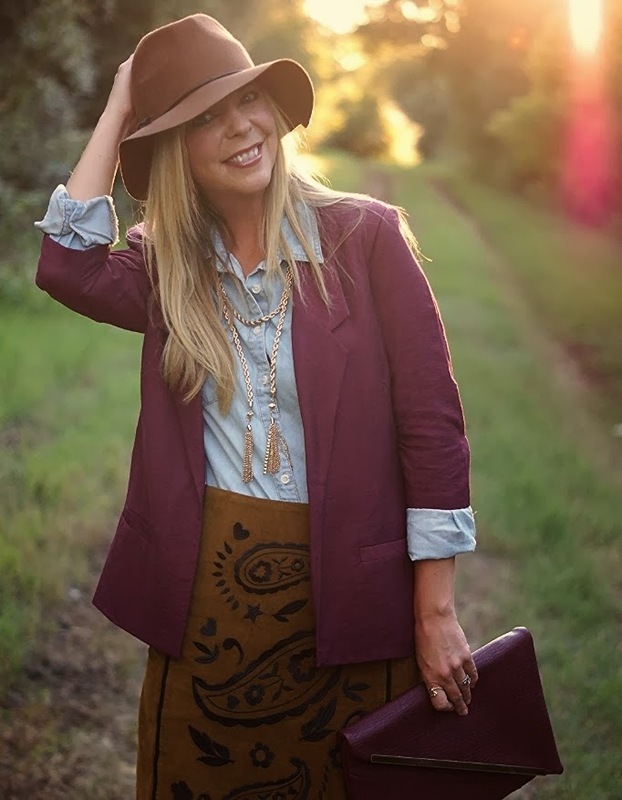 You sure do look adorable in this hat, you should definitely wear them more often on the blog! Wow such a Great fall outfit!!! you really look so fab! You look adorable. I'm really loving your Fall-y shoes! I want every part of this look!!! I love the hat, soooo cool. and chic and perfect! You look amazing! I love the hat on you, and those cutout booties are fabulous! Love the hat! And that skirt is so unique! Love this look! Love this look! You look adorable in hats. 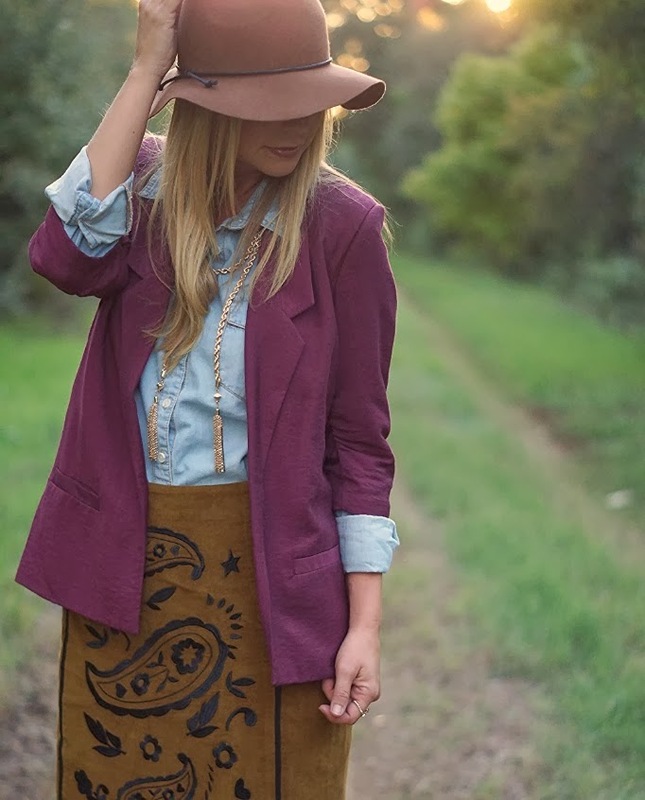 This is such a great fall outfit! Have a great weekend! You could pull of anything pretty lady! I truly do love you in this boho hat! You are looking so adorable from head to toe again Shanna.....love it when you introduce new brands to us! Your skirt is so unique.. :) Love the color of the skirt combined with the blazer..very pretty.. I love this, you should wear hats more often!!! You look great in hats! I love your shoes. They are so different and the suede texture is perfect for fall. I love this outfit! The lighting is perfect too!! You are gorgeous! That skirt is amazing...love the fun print! I love this hat on you Shanna!